Customer Review, Motobecane HAL eBoost PRO: Scott F.
"...great job…I own 3 bikes that cost over $9000 each and I had more fun on this (HAL eBoost PRO) bike than I’ve had in a long time." "Just a quick note to let you know how pleasantly surprised I am at the quality of this new Ebike (HAL eBoost PRO). You’ve done a great job…I own 3 bikes that cost over $9000 each and I had more fun on this (HAL eBoost PRO) bike than I’ve had in a long time." 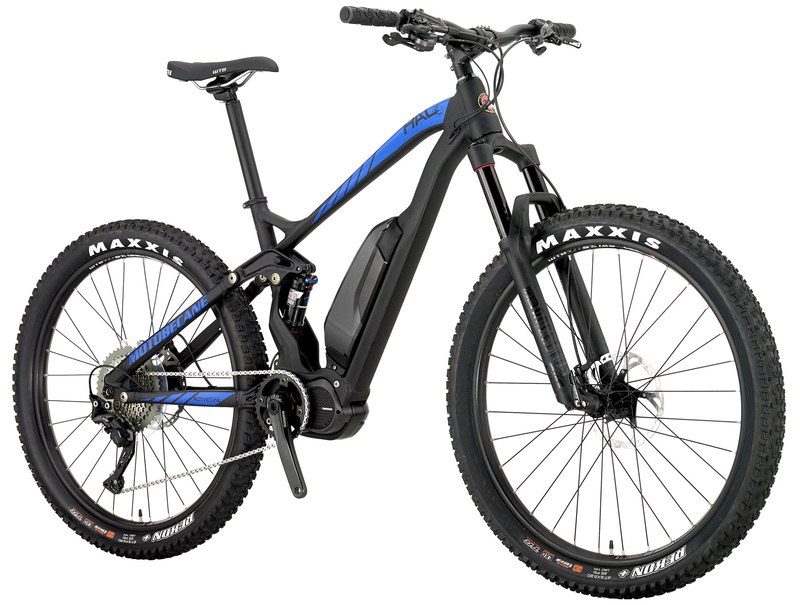 This is the much anticipated mid-fat, Electric Mid-Drive Plus Bike with Boost Axles HAL eBoost (Highly Active Linkage) by Motobecane USA. 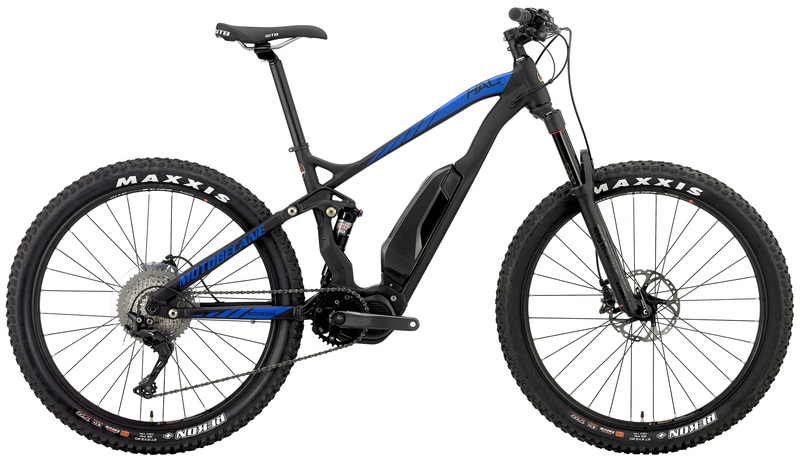 Building upon over a decade of FS design, this HAL eBOOST 27.5+ Full Suspension is designed for up to 5 inches of terrain taming travel both front and rear. The HAL Linkage uses a chainstay mounted pivot for even more supple suspension tracking and incredible control even while applying the brakes. Chainstays are optimized on the HAL eBoost models for incredible Billy Goat climbing and traction. Imagine the trails you will dominate with massive traction 27Plus Tires and a Rockshox PIKE 140mm up front with up to 5 inches of travel in the rear. Test riders Compare the HAL eBoost to Full Suspension Fatbikes like the Salsa Bucksaw. They say the HAL eBoost is a turbo-charged Dakar Rally car. The Salsa Bucksaw would be more like a logging truck. No corners are cut, the HAL eBoost TEAM Shimano E8000 Electric MidDrive has top-of-the-line Full Race specs. A 140mm Rockshox PIKE 27.5+/29er eBoost fork with up to 140mm of travel + in the rear, the NEWEST Rockshox MONARCH Air rear shock with Rapid Recovery Rebound Technology. Rockshox Pike forks MSRP up to $900+ and rated as one of the best, if not THE Best long travel fork Period! The HAL (Highly Active Linkage) Design represents the top of the food chain. Super supple. Climbing, descending and braking with more control than ever. The HAL eBoost Series features shorter chainstays than ever before = Billy Goat climbing ability and traction. What is eBoost: The HAL eBoost is a Boost spacing mountain bike. Boost is a new dropout standard designed to widen the hubs on the previous standard MTB spacing wheels. The rear axle is wider by 6mm to 148mm and the front axle by 10mm to 110mm. Wider flanges = wider bracing angle for spokes = a stronger and stiffer wheel. Allows the use of 29er wheels with higher strength and stiffness for top performance. Also, More tire clearance, ability to use 27PLUS tires and with shorter chainstays for superior handling and climbing. With the HAL eBoost's stock 27.5x2.8 tires you can hang with virtually anything on the trail. No worries about dealing with a Fat bikes super wide BB, the crank/pedals are no wider than a normal bike. Virtually all the float and traction of a full on full suspension fat bike, without excess flubber and jounce. 42cm - 5'8" to 5'10"
46cm - 5'11" to 6'1"
50cm - 6'2" to 6'4"